Yesterday the big Automated Transfer Vehicle approached the ISS in a first of two dress rehearsals to within 3.5 km; later that evening the pair - with the ATV leading the ISS - was photographed and filmed over Europe (another picture and more). From the ISS the ATV was also seen during the demonstration. The day before the two had been flying much farther apart as two movies show. Here are the plans for another demonstration tomorrow (when the ATV will come to within 11 meters of the ISS around 16:45 UTC; the go-ahead came minutes ago) and docking on Thursday at 14:41 UTC. You can follow the action via an ESA blog and see where the ATV and ISS are right now. Weather permitting there are one or two nicely lit overflights for Europe every evening in the coming days as Heavens Above tells us. In other news two satellite fuel tanks apparently survived reentry and were found in recent days, one in Australia and one in Brazil. • The three sunspot groups from the old cycle are now near the middle of the disk: a white light and an H-Alpha view (another one) of March 29 and a white light/H-Alpha blinking image and a calcium view of March 28. • An old impact crater may have been found in the U.K. • Yesterday's Earth Hour was followed in some places and could even inspire some stargazing - and caused controversy in Oz. • And here is an unusual panorama of a halo. Finally a (compared to most other discoveries) pretty bright supernova that medium-sized amateur telescopes should show well: In the spiral galaxy NGC 7793, located at -32° declination in the constellation Sculptor, a supernova of 12th magnitude has been discovered on March 25. SN 2008bk is located approximately 2.3 arcminutes north of the nucleus of NGC 7793, a bright flocculent spiral galaxy of type Scd. Exactly 5 months after its outburst the famous comet was still "was faintly, fleetingly visible with the naked eye on 2:15 UT March 24 under transparent skies (mag. 6.5 stars visible)," reports one Bob: "The comet appeared as a uniform smudge approximately 1/2 degree across. 10x50 binoculars showed a dim puff that was 1 1/4 degrees across". Tomorrow and the day after Holmes will be visited by Chen-Gao which will approach it to within 1° and may actually be seen in front of the coma - interesting especially for astrophotographers. While Holmes has been estimated at 5th mag recently, Chen-Gao is at 9th - and will be occulted by the Moon in April for East Asia, another photo challenge. In other news three papers in the mail today deal with the extraordinary "naked-eye GRB" (42 pages, only 5 days after the event! ), the demise of a bizarre 'discovery' in spiral galaxy statistics (already discussed by the Galaxy Zoo and Bad Astronomy blogs in January - an interesting cautionary tale) and the statistics of exoplanet discoveries at Keck: One can extrapolate "17-20% of stars having gas giant planets within 20 AU". In other news here are detailled optical light curves of the March 19 GRB from Polish and Russian astronomers. • Once again actual data show no cosmic ray climate effects, a dubious topic that comes up all the time. • A nice Moon halo was seen at Easter. • And USA 193 reacted differently to the rocket attack than expected. Rare event tonight: asteroid and its moon to occult star in Europe! "Another important occultation will occur in the next Saturday to Sunday night near 2:30 UT (i.e. on Easter morning)," advises J.Lecacheux on the PLANOCCULT mailing list: "The shadows of the big asteroid 22 Kalliope and of Linus, its 30 km satellite, will cross Near Orient and Europe diagonally, separated by 1094 km. Detecting Linus by occultation can provide a very accurate astrometric position, ten times better than the VLT or Keck Airy resolution, thus very useful to improve the satellite orbit. Only one previous successful occultation is known for Linus : when the Japanese observers caught both asteroid and satellite from the region of Tokyo on 2006 Nov.07. It allowed us to revise down the diameter of Linus from 38 to 30 km." Here are more maps of Kalliope's path. According to Lecacheux, the 40 km path of Linus "will fly over Syria, w.Turkey, n.Grece or s.Bulgaria, all the states of former Yugoslavia, n.e.Italy or s.Austria, Switzerland or s.Germany, n.e.France or Belgium, and finally s.England and Ireland. Assuming 50 km as '1 sigma' accuracy of the Linus ephemeris relative to Kalliope, the probability of positive occultation should be 15 % for any observer staying at the middle of the Linus track [...]. For example this probability should be 7.5 % from Brussels, Bern or Paris." The path of Kalliope, 255 km wide, will be centered 500±180 km "SSW from the Linus centre line. It will cover a part of Jordania and almost whole Israel, s.Greece (Crete and Peloponnese), a part of s.Italy, and finally a large strip running across the south and west of France." Lecacheux is a bit pessimistic, though, in his circular from yesterday, noting two circumstances that "will keep the situation far from idyllic. 1/ The bad weather now expected from many regions; 2/ The faint drop predicted, only 0.16 magnitude. The observation itself will be quite easy, even with modest telescopes and despite lunar vicinity, as the combined magnitude of the target (asteroid + star) will be V~10.7." Analyzing the measurements will be diffucult, though, and Lecacheux has an "advice: recording a two minutes dark sequence (with the telescope covered) just after the occultation, then subtracting at processing stage to every video image the so obtained 'mean dark pattern', will boost by a factor ~2 the SNR of a Watec 902x camera. This is an efficient way of improvement." In other news Arthur C. Clarke has been laid to rest in Sri Lanka today. • More results from Hinode have been published, • auroral activity may be up a bit due to the season, • and the last Hubble Servicing Mission may face delay because there aren't enough external tanks ready. • Readers should also be aware of repeated misleading meteor 'recommendations' from one (otherwise o.k.) website. 1 1/2 days after the event NASA has finally reacted with a Press Release to its satellite's success: "NASA Satellite Detects Record Gamma Ray Burst Explosion Halfway Across Universe". The story stresses that "the Very Large Telescope in Chile and the Hobby-Eberly Telescope in Texas measured the burst's redshift at 0.94. [...] A redshift of 0.94 translates into a distance of 7.5 billion light years, meaning the explosion took place 7.5 billion years ago, a time when the universe was less than half its current age and Earth had yet to form. This is more than halfway across the visible universe." Records, records: "No other known object or type of explosion could be seen by the naked eye at such an immense distance," and "GRB 080319B's optical afterglow was 2.5 million times more luminous than the most luminous supernova ever recorded, making it the most intrinsically bright object ever observed by humans in the universe." Observing reports are still streaming in, though the afterglow - imaged at 19th mag. later on the 19th by Finnish amateurs - of the remarkable GRB has now dropped to below 20th mag. So who did mention geostationary telecom sats first? Meanwhile many more obituaries and tributes to Arthur C. Clarke have come in, e.g. from an Indian SF author, in a Sri Lankan editorial or an Indian Leader or in the LA and NY Times' or Physics World. Details about his last interview, a growing collection of tributes and the strange travels of some Clarke DNA are there, a 1977 article on a rare U.S. visit has been re-published, and we even learned how to hold a moment of silence in cyberspace ... The fascination of space lives on, of course, and if it comes in the form the recovered video tapes from the STS-123 SRBs: The best 'action' starts at 2:08, 4:35, 5:35, 7:40 and 10:05! In other news a real unknown impact crater seems to have been discovered via Google Earth. • The MIT has students hunt asteroids via remote observing at the IRTF. • The NASA Eclipse Website has moved to a new URL and older ones will vanish; you find here e.g. all Eclipse Bulletins or info on the next TSE. • There has been no NOAA update on the coming 24th solar cycle for 11 months now, because these predictions are hard near the current minimum, but predictions by a single researcher now see a steep rise in sunspots beginning later this year. 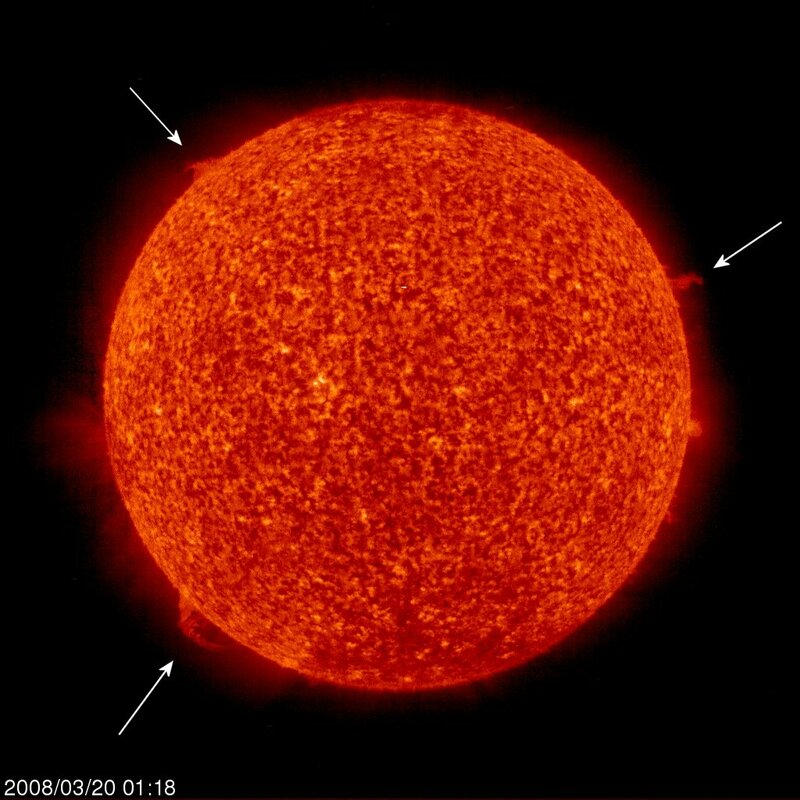 • Meanwhile be happy with three prominences seen today. Probably nobody looked at the right spot at the right time - but when GRB 080319B erupted this morning at 6:13 UTC, it would have been visible as a star of at least magnitude 5.8 for a few seconds at 14h 31m 40.7s +36° 18' 14.7" (2000.0)! According to THE ASTRONOMER Electronic Circular No 2432 a camera "located at Las Campanas Observatory imaged the region of GRB 080319b before, during and after the GRB with 10s exposures (IR-cut filter only)." Nothing was visible from 6:12:33 to 6:12:43 UTC down to 12th mag., but from 6:12:47 - 6:12:57 UTC a 10 mag. "star" was seen which from 6:13:01 - 6:13:11 UTC had risen to a maximum brightness of about 6th mag. Now a call is out whether someone by chance photographed this sky field at the right time - and observers with larger telescopes are encouraged to take deep exposures even now. In other news the death of Arthur C. Clarke has brought out numerous items of interest on the web such as the last ever interview he gave (transcript), a statement by NASA, a BBC piece with videos, an NPR piece with a radio feature, and obituaries galore from everywhere around the world, e.g. from the Planetary Society, the New York, Los Angeles and London Times', the Washington Post, ABC, the Guardian, CNN, the BBC, CBC and Space.com. And in the blogosphere responses came e.g. from SpaceRef, SpaceWeather, Wired, AstroProf, Planetary Soc., Nature, SpaceWriter, Voltage Gate, New Scientist, Univ. Today, Centauri Dreams, Cocktail Party Physics and NASA Watch. • Meanwhile, the storm on Saturn seems to be fading, the 2009 ring plane crossing is approaching, and it has been decided that we now have an Encke Gap - and not Division - in Saturn's rings. • Here's a DIY Deimos. • And March 29 features both an (international) Earth Hour in which cities should turn off their lights for one hour at 8 p.m. local time and the start of the (U.S.) Nat'l Dark-Sky Week, as the International Dark-Sky Association reminds us. Light pollution has become a big media topic now. Deeply saddened this blogger has just learned moments ago that A.C. Clarke has died in Sri Lanka at the age of 90. Links to more detailled obituaries will follow. As every year the - already 27th - AKM-Seminar, this time in Freital near Dresden, gave a great overview about the state of the art of meteor observation and analysis: This is one of the fields of astronomy where the level of amateur work is not much different anymore from what the (few) professionals in the field do. While meteor stream modelling has greatly advanced in the past ten years, thanks to the Leonid storms, there are still surprises happening (so one should be observing at every opportunity): For example in 2006 and again in 2007 the Orionids were more active than usual, with Zenithal Hourly Rates in the 60s instead of 20-25. This has since been explained by a 6:1 resonance with Jupiter of the meteoroids which not only explains enhanced Orionid activity in 1936, 2006 and 2007 but also predicts high rates of these bright meteors in 2008 as well as 2009 and 2010. Unfortunately the 2008 Orionids will suffer from moonlight as will the Geminids: The Perseids - with an expected ZHR of 110 - will be the only major shower this year free of lunar interference. When major fireballs light up the sky anywhere over Europe Thomas Grau will travel there, interview eye (and ear!) witnesses and go on a hunt for meteorites if a strewnfield is deemed likely and its location has been calculated. The results from extensive witness 'interrogation' can at times be more precise than using imagery from fireball camera networks, says Grau, who reported on three recent cases. The famous 1 March 2008 fireball had at first been suspected to have dropped small meteorites near (or even into) Lake Constance - simply because many early eyewitness reports had come from that area. But further reports have now made it clear that any meteorites would have fallen in central Switzerland instead where going after them will be tough. The characteristics of the fireball could also mean, though, that no solid matter reached the ground at all. Similarly confusing were the first reports about a fireball in France on 25 January 2008, 15 minutes after sunset. A cloud in the sky remained and was photographed, but because of wind drift its use for determining the trajectory was limited. Fireball sighting vectors from reliable witnesses, however, meet near one location, in the vicinity of Montpellier - and several mentioned strange "red and blue flames" trailing the fireball. No meteorites yet either. The last major success happened in Spain after a daylight fireball on 10 May 2007 which was accompanied by loud noises and shaking ground like during an earthquake. Although only 5 really good witnesses could be located, from their sightings and acoustical recollections a search zone could be located - and soon five small meteorites were found (among tons of meteowrongs in olive plantations). A further search by Grau yielded 10 more, and overall 100+ meteorites have been found in a 7 x 3 km zone, with together 800 grams - and they are eucrites, i.e. most likely splinters of asteroid Vesta. In other news the Moon and Saturn will meet tomorrow, a Saturn animation clearly shows its elusive rotation pattern, and even with 8" but modern electronic cameras amazing Saturn images are possible today. Another impact on the Moon has been videographed, this time from Maryland, astonishing lunar images with cell phone cameras, just held behind a telescope eyepiece, are possible - and you can bring out color on the Moon (that normally just looks yellowish) with clever image processing! Google's Sky service now also on the web - no extra software! The planetarium/visualization software released last year is no longer necessary to bring the sky to your computer: a website is offering the same, with highly zoomable real images from sky surveys. It works just like Google Maps and is pretty fast and smooth. In other news it is noteworthy that many Cassini images from the Enceladus flyby have stars in the background as the Saturn moon was in the shadow! The flyby was not as smooth as it first seemed, with a key dust instrument failing at a bad time. • Here's an unusual paper about micrometeorite impacts into space telescopes of the grazing kind - which are pretty common. As reported in several postings on NASA's Enceladus flyby blog the daring maneuver yesterday went well as did the downlink of many pictures - like this one! - and other data. 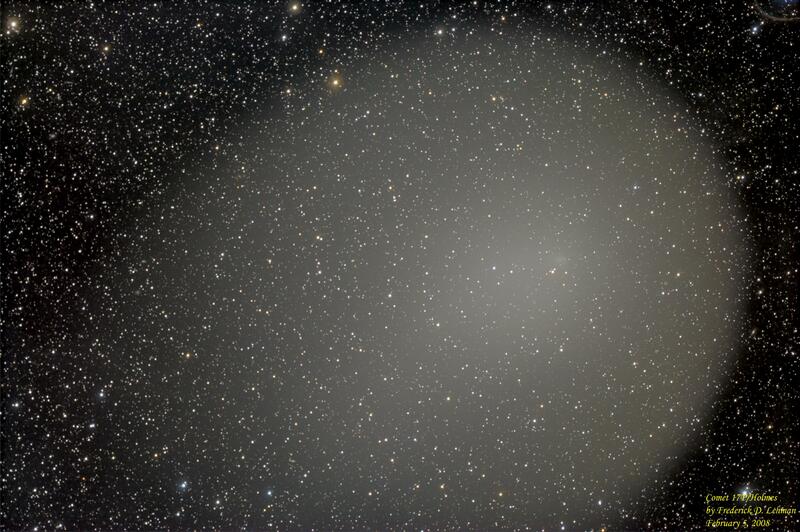 Hale-Bopp sets record: comet still active 26 AU from the Sun! "Eleven years after its perihelion, comet C/1995 O1 (Hale-Bopp) is still active," we learn in a paper for ApJL: Last October a diffuse coma 180,000 km in diameter was seen, with an integrated brightness of 20.04 mag. "The coma was relatively red at V-R=0.66 mag, which is consistent with that of the dust in other comets. The observed properties and the overall fading in brightness between 10 AU and 26 AU follow the predicted behaviour of CO-driven activity (Capria et al. 2002). This is the most distant cometary activity ever observed." In other news the mystery of the small impact crater in Peru last September - where no large solid mass should have reached the ground - was discussed at a conference: The strange event could change scientists' thinking about how meteorites act and how other craters on Earth were formed. • Here is an excellent picture of the Moon's ashen light on Mar. 9, two days after new. • The night launch of Endeavour was big fun for bystanders who saw the shuttle vanish in low clouds from nearby but arcing away from a distance. MECO and ET separation may also have been observed, but interpreting STS observations can be difficult. • Meanwhile no more fragments of USA 193 have been spotted for sure, so they must be pretty small. On March 12 the Cassini spacecraft will approach Enceladus to within 50 km and pass through a plume (as this video nicely explains). NASA has started an official blog to get all the details about this unique event out in near-real time! Also on March 12 - actually within the same hour that Cassini gets closest to Enceladus! - he Moon will come close to the Plejades star cluster and may occult some of its stars: This video shows the situation from Berlin, Germany. In other news a Cassini image of the current Saturn storm, an updated Holmes vs. the CA nebula sequence, an unusual video of Endeavour's launch into low clouds, the complete NASA launch video with cool plasma effects at MECO & ET sep (jump to 5:00 or better yet 6:40!) and a still frame. As announced, 2008 EZ7 flew by Earth - but there is another one on a somewhat similar orbit. Or may be not, as the orbits are not that similar after all, raising questions about a direct connection of the two. In any case the 2nd asteroid, meanwhile named 2008 ED8, is in Earth's vicinity right now, again very briefly reaching mag 12 to 13. In other news the Moon is back in the evening sky, already 2 days old (here it is 3/4 of a day earlier). • The new Nova Cygni 2008 is easy to find and was at mag 7.8 last morning. • There are updates on the state of Holmes' coma and the March 1 bolide which may have dropped meteorites in the Schaffhausen area. • And you can listen to TA's Guy Hurst on the radio (Broadcasting House on BBC 4 yesterday morning), talking about the state of amateur astronomy at minutes 44-49, or to other cosmic sounds from all kinds of sources. Nova Cygni 2008 was discovered yesterday by Japanese amateur Hiroshi Kaneda during his sky survey with a digital camera + 105-mm f/2.5 telephoto lens: He found the nova at mag 8.2±0.3 on on Mar. 7.801 UTC. The 'new star' is at R.A. = 19h58m33s.4, Decl. = +29o52'04" (equinox 2000.0; uncertainty estimated to be ±15"), according to CBET # 1291 of today. Kaneda noted "that nothing is visible at this position on his patrol frames taken on 2007 Oct. 5, (limiting mag 10.5), 2008 Jan. 1 (limiting mag 10.7), and Feb. 18 (limiting mag 10.5); also, nothing is present on the Digitized Sky Survey within 20" of this position to mag 13.0." Numerous additional claims of independent discovery have since come in, the first being from Zhang-wei Jin and Xing Gao, using a Canon EOS 350D camera (+ 7-cm-aperture, 200-mm-f.l. f/2.8 telephoto lens) at Xingming Observatory, Mt. Nanshan, China - during the same nova survey that led to a comet discovery (later named Chen-Gao) a month ago! "Dust halo" or "ring" found around Saturn's moon Rhea? There has nothing been seen by any camera on Cassini, so the evidence is all indirect yet intriguing: a paper in today's Science (319, 1380-4) talks about "solid material that can absorb magnetospheric particles" which "Rhea's magnetospheric interaction region, rather than being exclusively induced by sputtered gas and its products, likely contains". The evidence for that is the finding that "energetic electrons are depleted in the moon's vicinity" in combination with the "absence of a substantial exosphere" which one would have expected. But what's the absorber? "Combined observations from several instruments suggest that this material is in the form of grains and boulders up to several decimetres in size and orbits Rhea as an equatorial debris disk," continues the abstract: "Within this disk may reside denser, discrete rings or arcs of material." For the JPL (and the media) these possible rings are worth a headline, the LANL goes with the "dusty halo" from the paper's original title instead. 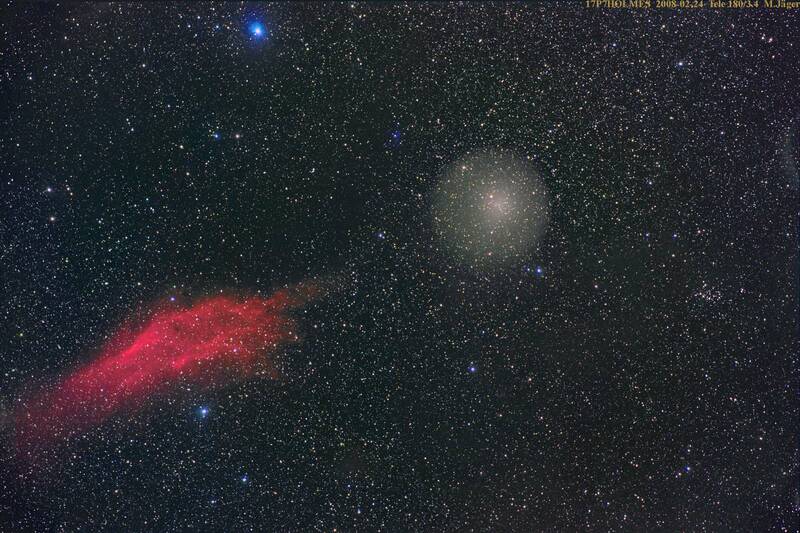 The comet is now touching the big nebula as a picture of today shows - it had been creeping closer for weeks. In other news a sixth Neptune trojan has been discovered, and the Moon visited Venus & Mercury this morning. Just around the time of opposition (coincidence!) an impressive storm in the STrZ of Saturn appeared, looking - at the resolution of amateur telescopes - like a bright spot. Now one of the best images (from Feb. 19) has been published, and you follow the storm's evolution e.g. with the ALPO Japan archive. It's well seen on images of March 3 and 1 and Feb. 23, 20 (from another source), 15 and 8 - this is the earliest report I could track down. In other news the March 1 fireball over Central Europe is having some media impact, e.g. in Switzerland and Southern Germany - where some mass may have reached the ground. And in parts of the U.S. the Moon will occult Venus or come very close, during daylight on March 5. For a change here's a pointer to a most amazing image from the Mars Reconnaissance Orbiter's HiRISE camera: It shows at least four Martian avalanches, or debris falls, in action on Feb. 19! It is extremely rare to catch such a dramatic event in action. Recently the MRO also imaged Earth & Moon from Mars orbit, demonstrating its enormous resolution. In other news the recent lunar eclipse has been analyzed for the dustiness of Earth's atmosphere (not much volcanic debris there) while in contrast the "536 AD climate event" that some thought was caused by a cosmic impact has now been shown to have a volcanic origin. And there are yet more technical details of the USA 193 attack being determined by eager amateurs. At 22:44 UTC on March 1 a major fireball lit up the landscape in Central Europe (some say for seconds it was as bright as daytime) and spawned numerous visual reports (more, more, more) - and a tremendous bang was also heard. In other news the USA 193 debris situation remains a bit confusing as the NOTAM turns out to be old (issued just before the attack took place) and the delay of one satellite launch - but not of other missions - must not be blown out of proportion. In any case modelling of the known fragments' decays shows that they should all be gone by mid-month. 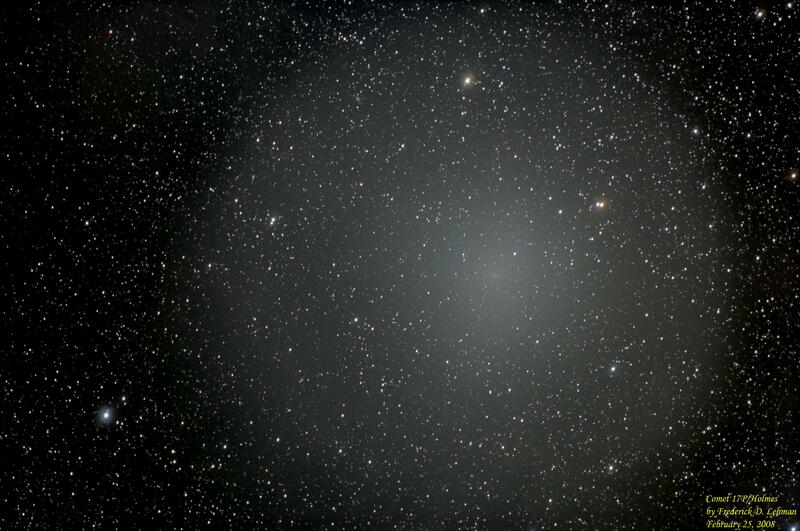 March 4 to 12: Comet Holmes slides by the California Nebula, a feast for astrophotographers as images from Feb. 24 and 27 demonstrate. See also below for Holmes' behavior. 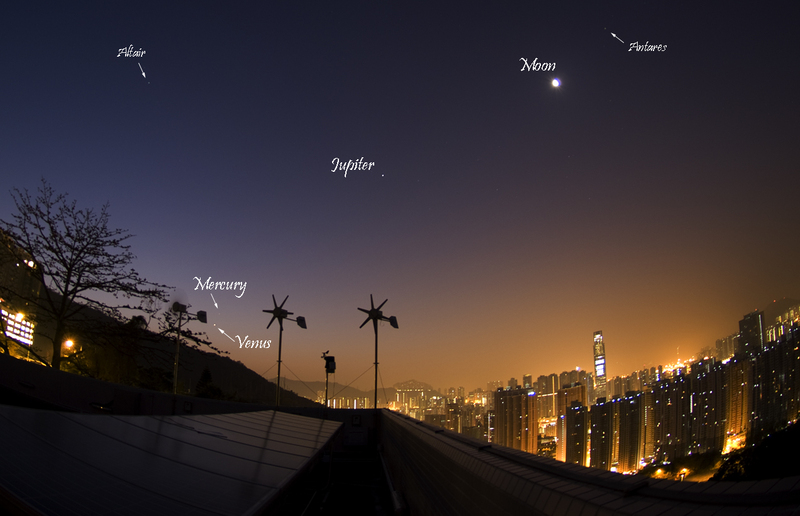 March 5, around noon UTC: Moon close to Venus & Mercury (here's a recent morning view from Hongkong). 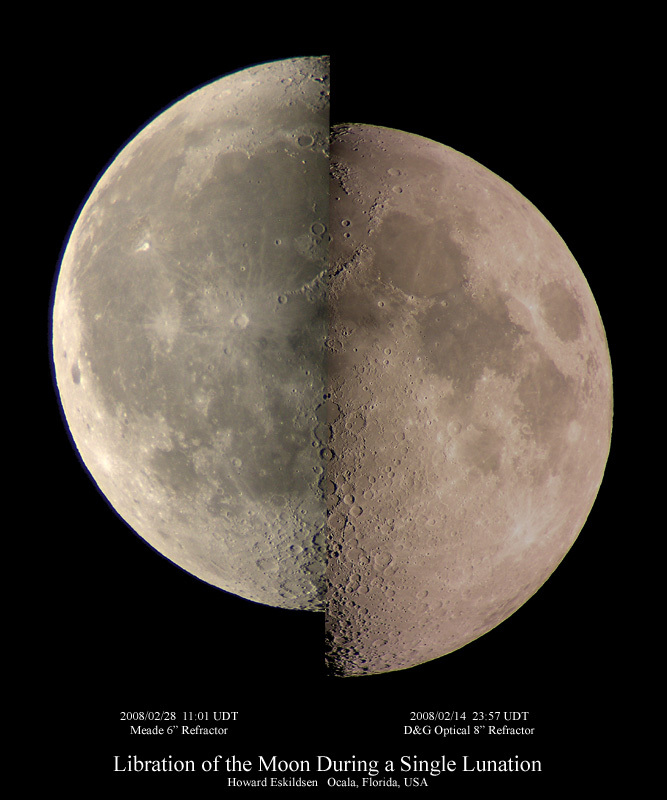 March 23: Unusually early Easter Sunday (spring began on March 20 at 5:48 UTC, Full Moon was on March 21 at 18:41 UTC). Only in the year 2160 will we again have such an early Easter Sunday (the last one was in 1913) - to be beaten only in 2285 with the earliest possible Easter Sunday ever, March 22 (which last happened in 1818). A small nebula around RY Tau that made news 3 years ago as an amateur target for the Gemini telescopes has now also been imaged with an amateur instrument, albeit a pretty large one. The first images of annularity of the Feb. 7 eclipse over Antarctica have been published as have been another nice view of the subsequent lunar eclipse from Hawaii (which was observed in many countries), a comparision of 12 eclipses and a stark demonstration of libration.